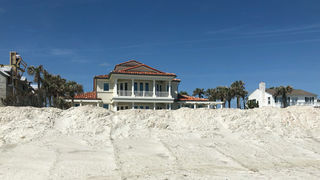 An I-TEAM investigation into several wealthy St. Johns County homeowners, including United Airlines CEO Oscar Munoz, has uncovered evidence that sand was excavated from a public beach to protect their properties. According to the Florida Department of Environmental Protection, those homeowners may have skirted laws designed to protect the state’s natural resources. Like much of the beachfront in Northeast Florida, the dunes along the beach on Ponte Vedra Boulevard near Solana Road were largely wiped out by Hurricanes Matthew and Irma. But the dunes in front of four homes, including that of Munoz and other high-profile executives, appear to have been recently shored up compared to the untouched dunes near neighbors’ homes. Tracks left behind in the sand near the restored dunes indicate bulldozers and other machinery were used to scrape sand from the existing beachfront -- a possible violation of state regulations. Video provided to the I-TEAM by a neighbor who wished to remain anonymous shows two earth movers scooping sand from the public beach last week and hauling it toward four private homes. Local and state authorities contend that work wasn't permitted, and those behind it could face fines and other civil penalties. The beach is a treasure to neighbors, like Bill Hudson, who aren't thrilled about what took place last week, something they're calling an abuse of natural resources. "We're outraged about this," said Hudson. "It's a poor reflection on the whole community that someone would be that presumptuous to virtually steal something that belongs to the public and use it for personal gain." The I-TEAM checked with St. Johns County officials and the Department of Environmental Protection, who called the process "beach scraping." They said no one was allowed or authorized to perform that kind of work in the area. Neighbors say bulldozers were used to illegally scrape sand from a public beach to restore the dunes in front of four private properties, including that of United Airlines CEO Oscar Munoz. In addition to Munoz, public records show some of the remaining properties are owned by other high-profile -- David Brown, chief executive officer and president of Web.com, and Chris Aitken, managing director for UBS Financial. The fourth home, currently under construction, belongs to a Margaret Conolly. The I-TEAM made multiple attempts to reach the homeowners by phone, email and in person for their sides of the story. Of those, only Brown responded. He said he was unaware of any notice from the state, but vowed to cooperate with the state's inquiry. State records obtained by the I-TEAM indicate the Department of Environmental Protection launched an investigation after performing inspections at the four homes March 21 in response to a complaint. The DEP followed up Wednesday with notices sent to each of the homeowners, informing them of the state investigation and warning that they could potentially face fines and be held responsible for damages and restoration fees. On Thursday, beachgoer Wendy Vaughn wondered why somebody would do something like that, particularly someone of means. "If they can afford homes like that, they can afford to have sand brought in and do it the right way," she said. That's exactly what Hudson and some of his neighbors did in the wake of Hurricane Matthew. He said they banded together and got permits from the state to have their dunes rebuilt -- legally. It cost $28,000 for his property alone. "These people in these houses obviously have the financial wherewithal to fight the DEP," said Hudson. "It will be interesting to see if the DEP has the strength of character to stand up for the public." Since the beach scraping is a civil matter, none of the homeowners faces criminal charges. While the notices sent to them do not specify how much they could be on the hook for in fines, they do state that the homeowners have 15 days to respond and explain themselves. To learn more about the rules and laws governing coastal construction, visit the Department of Environmental Protection's website.